TASK™ 12 Product Information | Smooth-On, Inc.
TASK™ 12 is part of the TASK™ series of high performance casting resins. It is a semi-rigid urethane resin that offers extraordinary handling strength and impact resistance. Castings are tough and durable. 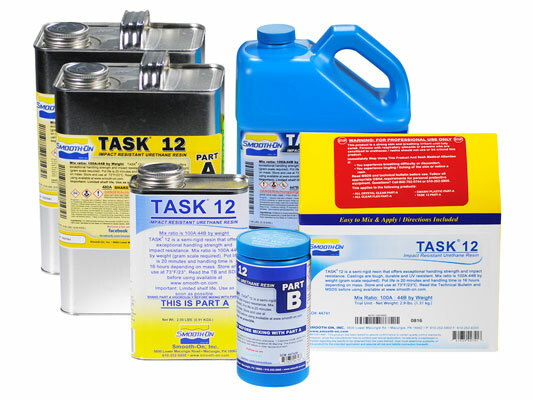 TASK™ 12 can be color pigmented or filled and is used for a variety of industrial applications including making prototype models, high impact parts and tools. Materials should be stored and used in a warm environment (73°F/23°C). These products have a limited shelf life and should be used as soon as possible. All liquid urethanes are moisture sensitive and will absorb atmospheric moisture. Mixing tools and containers should be clean and made of metal, glass or plastic. Mixing should be done in a well-ventilated area. Wear safety glasses, long sleeves and rubber gloves to minimize contamination risk. Measuring - The proper mixing ratio is 100 Parts of Part A to 44 Parts of Part B by weight. You must use an accurate scale (gram scale or triple beam balance scale) to weigh the Part A and Part B components properly. Dispense the required amount of Part A into a mixing container. Weigh out the appropriate amount of Part B and combine with Part A.
Mixing - Part B (blue label) must be stirred well before use to redisperse ingredients that have settled. Mix thoroughly for 90 seconds. Stir slowly and deliberately making sure that you scrape the sides and bottom of the mixing container several times. Vacuuming - TASK™ products are low in viscosity and do not require vacuum degassing. If you choose to vacuum the material, subject mixture to 29 h.i.g. mercury in a vacuum chamber until mixture rises, breaks and falls. Allow for 3 to 4 times volume expansion in mixing container. Be aware of pot life so that material does not set up in mixing container. Pouring - Pour mixture in a single spot at the lowest point of the mold. Let the mixture seek its level. A uniform flow will help minimize entrapped air. For Best Results . . . Best results are obtained using a pressure casting technique. After pouring the mixed compound, the entire casting assembly (mold, dam structure, etc.) is placed in a pressure chamber and subjected to 60 PSI (4.2 kg/cm2) air pressure for the full cure time of the material. Post Curing - Castings will reach “full cure” faster and achieve maximum physical properties and heat resistance if TASK™ 12 is post cured. Castings should be post cured in a mold or support structure. Allow the material to cure for 16 hours at room temperature followed by 4 - 8 hours at 150 - 160°F (65 - 72°C). The casting or part should be allowed to cool to room temperature before handling. Performance - Cured castings are rigid and durable. They resist moisture, moderate heat, solvents, dilute acids and can be machined, primed/ painted or bonded to other surfaces (any release agent must be removed). 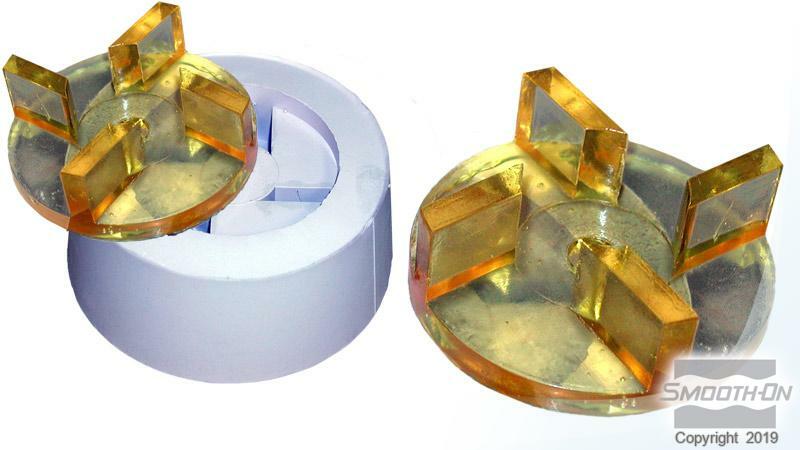 If machining cured TASK™ plastics, wear dust mask or other apparatus to prevent inhalation of residual particles. Castings can be displayed outdoors after priming and painting.